The Eurozone’s growth spurt sped up in Q2, with the economy growing at the fastest pace in over two years. A preliminary estimate revealed that GDP expanded a seasonally-adjusted 0.6% over the previous quarter, a notch above Q1’s 0.5% and slightly above FocusEconomics analysts’ expectations. Although a breakdown by component is not yet available, the Eurozone’s growth story is expected to have remained largely unchanged, with upbeat sentiment, a tightening labor market and stronger global growth driving the acceleration. Looking at available GDP data for the individual economies, the Netherlands was the standout performer in the second quarter, expanding at a pace that the country has seen only three times so far this century. The impressive result was underpinned by falling unemployment, a thriving housing market and high consumer sentiment. Growth also gathered pace in Spain, where the economy has finally returned to near pre-crisis levels. Elsewhere in the region, activity was steady in Austria and Slovakia, but slowed in Belgium, Cyprus, Germany, Latvia, Lithuania and Portugal. Meanwhile, growth was also stable in major players France and Italy compared to the previous period. Leading indicators point to another quarter of buoyant activity, and FocusEconomics analysts see GDP rising a healthy 0.5% in Q3. Downside risks to economic momentum have waned in recent months as politics recedes to a less prominent role in the bloc. The Greek government is sufficiently financed for this year, and elections have played out as expected so far this year and should continue to do so. The upcoming German vote is widely expected to yield a favorable economic positive outcome, as polls point to Angela Merkel’s CDU as the clear frontrunner and policy continuity for the healthy economy. However, a few political hurdles still need to be cleared across Europe. The Netherlands remains without a new government four months after their elections, and Spain is gearing up for a contentious referendum on Catalonia’s independence. In addition, French President Emmanuel Macron’s approval ratings have plunged as he gears up to pass ambitious economic reforms. The FocusEconomics panel upgraded its outlook for the Eurozone again this month, after raising it in the two previous publications. GDP is seen growing a robust 2.0% this year, a notch above last month’s projection, thanks to a firmer labor market, vibrant investment and healthy external demand. Next year, growth is seen as slightly more modest at 1.8% as tailwinds wane. The recent positive data drove a number of upward revisions for individual economies this month. Eight countries saw their GDP forecasts lifted, including Germany, the Netherlands and Portugal. No changes were made to the projections for regional heavyweights France, Italy and Spain, along with six other economies. Finland and Malta were the only countries whose forecasts were downgraded. 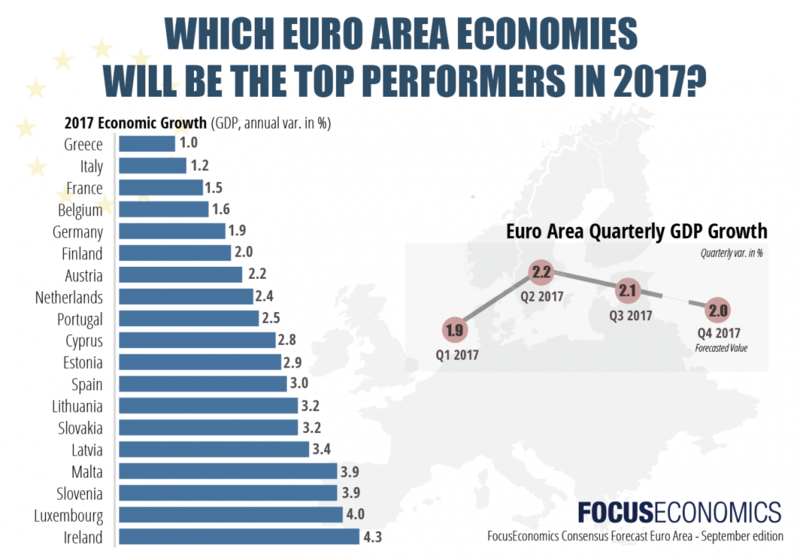 Ireland and Luxembourg are expected to be the fastest-growing economies in the region this year, expanding at rates of 4.0% or above. On the other end of the spectrum, Greece and Italy will be the region’s laggards, both growing at around 1.0%. Among the remaining major economies in the region, Spain will outperform the rest with 3.0% growth. Germany is seen expanding 1.9%, followed by France at 1.5%. The German economy’s dynamism remained on full display during Q2, and all signs indicate it will be sustained in H2. Although GDP growth moderated somewhat over the previous quarter in Q2, it remains vigorous, with domestic demand doing most of the heavy lifting. The positive momentum has seemingly carried over to Q3: Confidence indicators continue to hover at all-time or multi-year highs. The upbeat narrative bodes well for Angela Merkel’s reelection odds, with only a few weeks to go until federal elections are held on 24 September. Merkel’s ruling Christian Democratic Union party is polling close to its 2013 election result, when it just missed out on an absolute majority. With little resistance on her way to an almost guaranteed fourth term, the real political battle will likely be fought after the election during coalition negotiations, as six parties are expected to sit in Germany’s lower house, up from four at present. With little political uncertainty ahead, economic growth is expected to be broad-based. A tighter labor market is expected to push up wages, which should keep household consumption growing at a healthy pace. The external sector should also continue providing solid support to growth, thanks to the global economic upswing currently underway. Our panel expects GDP to grow 1.9% in 2017, which is up 0.1 percentage points from last month’s forecast. For 2018, the panel expects GDP growth of 1.8%. Preliminary data shows that the economy expanded 0.5% for the third consecutive term in Q2 driven by a strong external sector. Economic activity is expected to remain on a steady footing with strong survey-based data in Q3, robust overseas demand and an improving labor market which should bode well for private consumption. Q2’s headline figure has been taken with cautious optimism by the government. President Emmanuel Macron is walking a tightrope as he prepares to present his ambitious labor reform bill next month. Strikes are already planned in response, and expectations of additional budget cuts will generate resistance and could further erode his declining popularity and undermine the implementation of his economic program as a result. The economy is expected to accelerate this year and next on the back of a recovery in exports and solid domestic demand. The outcome of the spring elections has dissipated fears about the country’s short-term economic future and political trajectory, and has generated optimism. Panelists participating in the FocusEconomics Consensus Forecast expect GDP to accelerate mildly to 1.5% this year, which is unchanged from last month’s forecast. For 2018, the panel foresees growth of 1.6%. Economic growth came in at a respectable pace in Q2 according to preliminary figures, thanks to expansions in the industrial and service sectors. The latest indicators suggest that the economy continues to tick over in the third quarter, with the manufacturing PMI remaining firmly in expansionary territory in July, and business and consumer confidence hovering close to multi-year highs in August. Increased consumer optimism has translated into a willingness to spend, which has been reflected in a pickup in retail sales in recent months. On the external front, there are also some positive signs; buoyed by solid growth in the economies of major Eurozone trading partners, Italy’s current account surplus rose markedly in H1. However, the economic situation is far from secure. GDP growth is persistently lagging behind the Eurozone average, and the economy is plagued by a high stock of public debt, as well as structural weaknesses in the labor market and the banking system. The latter is of particular concern, and it makes the country vulnerable to the possible withdrawal of some ECB monetary stimulus over the coming year. The economic expansion going forward will be propped up by an improved external environment, steady household spending and rising business investment. However, growth will likely be subdued as a result of a lack of international competitiveness, a low labor market participation rate and a vulnerable financial sector. FocusEconomics Consensus panelists forecast a 1.2% expansion in 2017, unchanged from last month, and a 1.1% expansion in 2018. The economy roared through the first half of the year, expanding at a faster-than-expected clip as both the domestic and external sector added to growth. Private consumption accelerated markedly in the second quarter as households continued to benefit from strong job creation and credit growth. So far this year, the brilliant performance of the labor market has kept household spending at healthy levels despite higher inflation and depressed wage growth. This trend seems to have carried over into the third quarter, with employment growth in the manufacturing sector growing at the fastest rate in nearly two decades in July, and growth in Social Security Affiliations for July decelerating only slightly from the previous month. Although too early to tell, the all-important tourism sector seems to have escaped largely unscathed from the terrorist attack that hit Barcelona in mid-August, as suggested by hotel occupancy rates in the touristic city. Economic growth is expected to come in at a similar pace to last year’s, the result of a much stronger than expected H1 performance. Growth will continue to be broad-based, with the domestic sector benefiting from higher disposable income and buoyant sentiment, and the external sector supported by an upturn in global trade. The rate of expansion, however, will moderate as some of the tailwinds dissipate in upcoming months. Our panel kept their projection for this year steady at 3.0% this month. Panelists see growth of 2.5% in 2018. More complete data confirmed that harmonized inflation was unchanged at June’s 1.3% in July. Despite strong growth momentum, price pressures in the block remain meagre overall, and inflation is significantly below the ECB’s target of just under 2.0%. Moreover, developments in the exchange rate market are likely to impact price pressures and could complicate the ECB’s upcoming monetary policy decision. The robust economic momentum, along with a scarcity of assets, suggests that the Bank’s ultra-loose monetary stance is no longer necessary and has led to calls for policy makers to taper the institution’s bond-buying program. However, a strong appreciation in the euro in the past months is threatening to push inflation down further from the Bank’s target. The strengthening is largely due to the movement of the USD, and will thus complicate the Bank’s tightrope walk of balancing growth and inflation. In a high-profile speech at the Jackson Hole symposium, ECB President Mario Draghi refrained from giving any clues on the ECB’s upcoming monetary policy decision and stuck to the theme of “fostering a dynamic global economy”. Notably, Draghi spoke out against protectionist policies at a time when the U.S., a key EU trading partner, is starting to reexamine NAFTA. Draghi emphasized that protectionism could pose a serious risk for global growth and also cautioned that strong regulation of financial markets is needed to prevent financial imbalances. However, the speech was largely anti-climactic overall as Draghi mostly abstained from discussing monetary policy. The FocusEconomics panel sees inflation of 1.5% this year, which is down 0.1 percentage points from last month’s forecast. In 2018, inflation is seen averaging 1.4%.